Keys are a vital necessity in our culture, providing access to physical properties. Possession of a key indicates one’s right of access. They open doors to the comforts of home and ignite the engines of vehicles. Duplicate keys grant entry for multiple household members and business employees. The word “key” is often used as a metaphor. We speak of the key to success in a given skill, the key to effective relationships and even the key to someone’s heart. All of these metaphors deal with unlocking secrets for accomplishing or acquiring something desirable. Jesus spoke of keys to the kingdom of heaven that He alone possesses and desires to share with His children. These keys represent the authority given to us in Christ to access the riches of heaven. The greatest key that unlocks our potential to live presently as holy citizens of God’s Kingdom is faith. 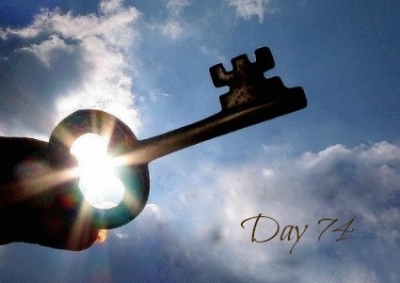 This key grants us access into God’s immense storehouse of grace. Once opened, we can avail ourselves of all God possesses. His love, presence, power and infinite resources are everything that we need to live a godly life at all times. Are you standing at the threshold of God’s great grace, but refusing to use the key of faith received when you trusted Christ as your Savior? This is as ludicrous as a beggar who has been given the keys to enter a castle, but refuses to access the free and perfect supplies available to him. We, as God’s children, often choose to live like that beggar. When we refuse to use our key of faith, we are locked out from experiencing the reality of God’s promises and His sustaining grace. Come to Jesus. Set your heart on cultivating a deep and intimate knowledge of Him. Allow His words and Spirit to reign in you. Your key of obedient faith unlocks the mighty power of God’s Spirit and His Word, producing godly character in you. This is the secret to holy transformation. Your character will increasingly mirror your holy identity as God’s child.